Here’s a spec ad for a spec phone that bears the Apple logo, but has no relation to Apple itself. 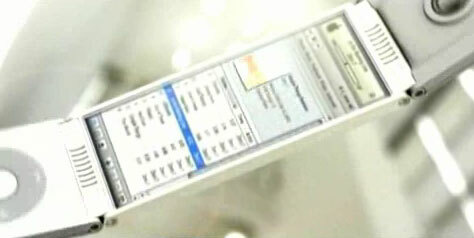 In fact, the auteur, Christopher DeSantis, is careful to point out, “The designs presented are purely fictional in nature and do not suggest or infer any current or emerging product design efforts by, nor affiliation with, Apple Computer.” (Apple’s actual music phone, the Rokr from Motorola, was launched in September.) I’ll reserve judgment except to say that I’m more impressed by the design of the non-existent phone than I am with the ad itself, which has its own merits. Kind of looks like an iPod Nano mated with a Motorola Razr. Cooooool.